Students working at a distance in two different ILSs share a simulation of rabbit genetics. Changes made in one version of the simulation are simultaneously shown in the other version. However, in one version, there are black rabbits and in the other version white rabbits. In both versions, there are rabbits with straight and floppy ears. The students can discover which traits are dominant and which ones are recessive. In addition, they can determine the probabilities of dihybrid crossing. 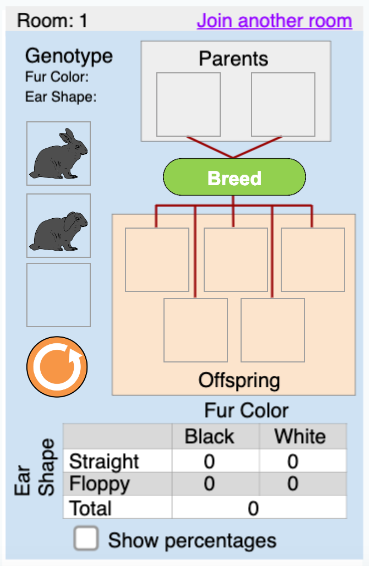 1) Is it possible in this simulation for two black rabbits to produce a white offspring? 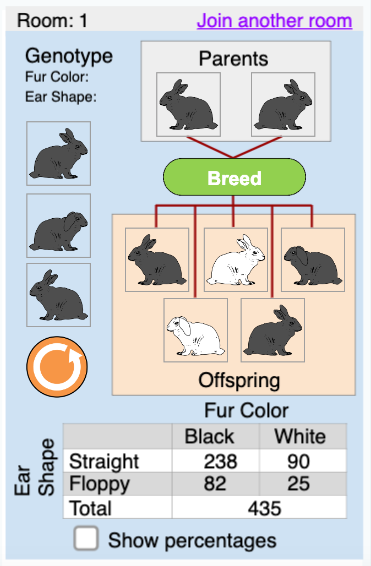 2) Is it possible in this simulation for two white rabbits to produce a black offspring? 3) Is it possible in this simulation for two rabbits with straight ears to produce a rabbit with floppy ears? 4) Is it possible in this simulation for two rabbits with straight ears to produce a rabbit with floppy ears? 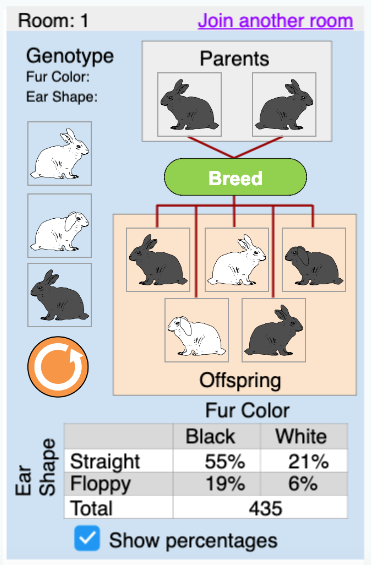 Because the simulation initially begins with rabbits with homozygous traits, it is necessary to create a second generation of rabbits with heterozygous traits, save them in a temporary box provided in the simulation, and then cross rabbits with heterozygous traits to discover that it is possible for two black rabbits to generate a white offspring. Collaboration between two students can be arranged face-to-face where they speak to each other but do not look at each other's simulation. For collaboration via text-based messaging it is suggested to use the SpeakUp app. 1.) 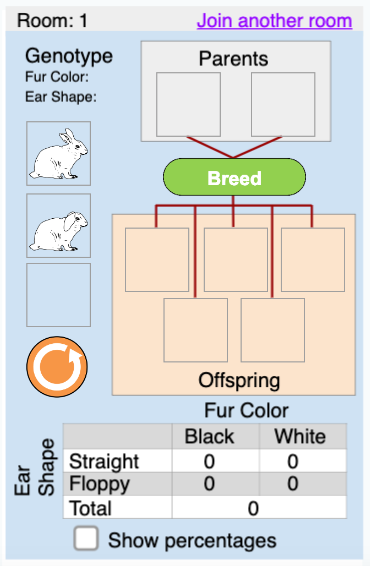 When you click on the "Create Space" button you will create an ILS that has two versions of the Collaborative Rabbit Genetics Lab in the investigation phase. The version labeled ‘Black rabbits’ will initially allow a user to select a straight eared or floppy eared black rabbit. The version labeled ‘White rabbits’ will initially allow a user to select a straight eared or floppy eared white rabbit. 2.) Because two versions of the lab are created, you should delete one of them and rename your ILS appropriately (e.g., Rabbit Genetics Lab - Version A). Then return to the Collaborative Rabbit Genetics Lab page at Golabz and click again the button "Create Space". This will create another new ILS with the two versions of the simulation. Simply delete the version of the lab for which you already have an ILS of and rename the new ILS appropriately (e.g., Rabbit Genetics Lab - Version B). 3.) The Collaborative Rabbit Genetics Lab requires students to communicate, and if a teacher prefers them to communicate via text messaging, then a chat tool, such as the SpeakUP app, can be used. Include the SpeakUP app preferably before the lab. To use the SpeakUP app, students are required to enter a common room number or create a room and share the number of the room with the other student(s). As a teacher, you can also create multiple room numbers using the SpeakUP app and assign them to students as you like. This will allow you to access their chat transcripts later to read how they communicated with each other. The Collaborative Rabbit Genetics Lab starts by asking users to enter a chat room number (which users of the SpeakUP already have). As long as two users enter the same room number they will share the same simulation.